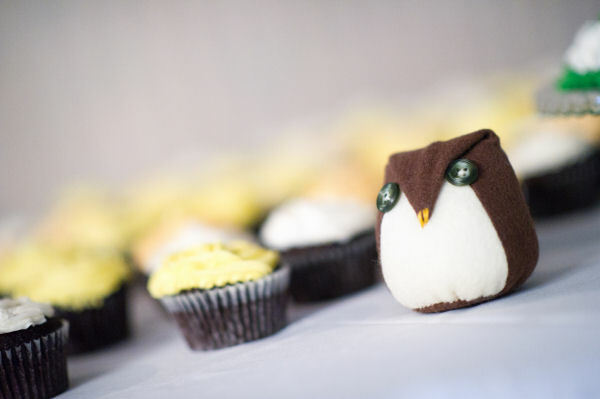 A couple of dear friends of mine got married last October, and they asked me to make their wedding favors, a massive parliament of Little Hootie Owls. Each guest received a box upon arriving at the reception. The box was labelled with their table number and contained a Little Hootie Owl. 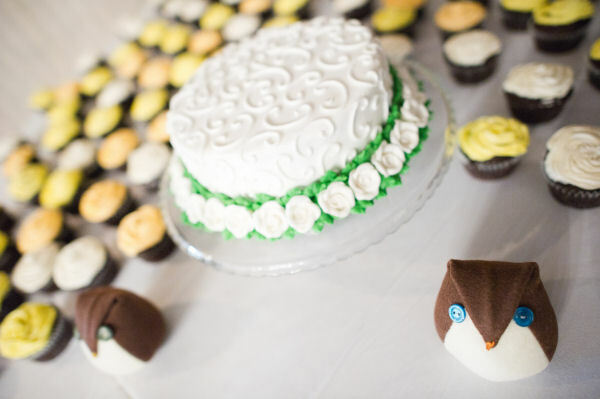 We also decided it would be a good idea to make Big Hoot owls for the bride and groom. They sort of served as off-the-cake cake toppers, or maybe, a guard of honor for the cake? I love to think that the Big Hoots and the Little Hooties made a sweet little memento that people will actually keep. Something worth holding on to, that serves as a warm reminder of a lovely day. Not that little bags of jordan almonds aren’t totally awesome or anything. Thanks, friends, for letting me be a part of your wedding. 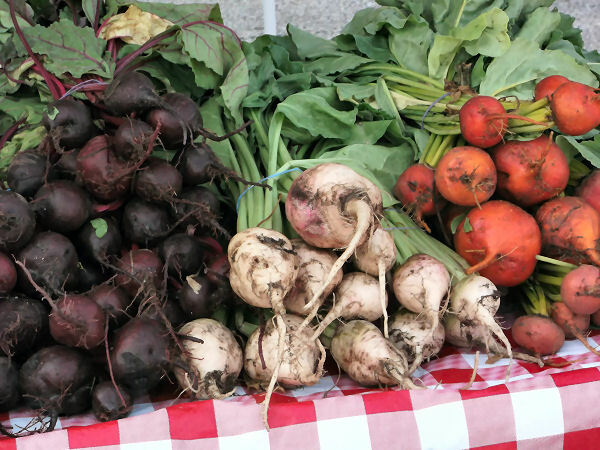 Today was the first RiverFront Market of the season. The sky was blue and the weather was warm, and it was nice to see familiar faces again. 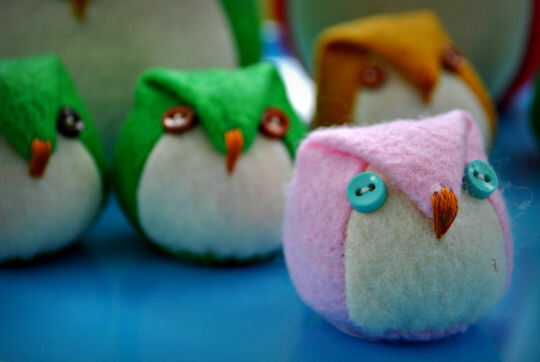 After making what felt like a million little hootie owls for a friend’s wedding last fall, I took a bit of a break from owls and had almost none left. I finally sat down this past week and made a whole mess of them. A few have already gone to new homes, but there are still plenty waiting for that special someone. Soon, I’ll be putting some of these little guys into mobiles. A whole parliament of owls is always better than one, right? Thanks to everyone who stopped by and said hello at the market today! I hope to see even more familiar faces (and new ones) next week. I saw sugar snap peas, and lettuce, and tomatoes, and fresh herbs this week. 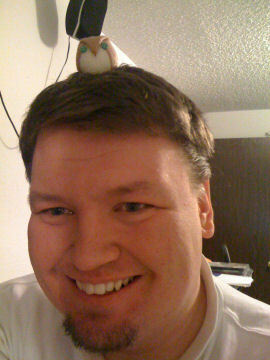 Even if you don’t need a little hootie owl, a trip to the market is worth it. I’ll be down on the riverfront again next Saturday, from 8am until noon. And Sunday, I’ll be out at Sommerfest in Hickory Grove Park from noon – 5pm. Sommerfest is an annual event held by the Peoria German American Society, and is a fun way to get out and enjoy some German food, music, and beer. And arts and crafts. And air rifles. How could you miss that? See you next weekend! You may have noticed by now that I’m a fan of photos of Anodyne Design items in “action.” Most of these photos come after someone has purchased the item, but it has recently come to my attention that there is whole other realm of possibility for action shots: wandering photographers at craft show and farmers’ markets. 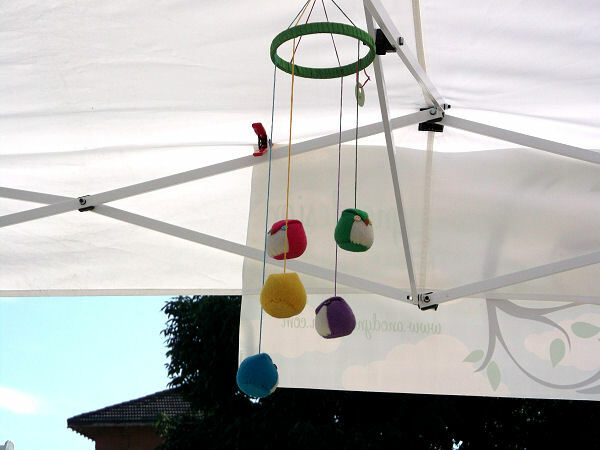 Farmers’ markets in particular seem to be especially appealing to the itinerant photographer, and apparently even photographers cannot resist the cuteness of the Little Hootie Owl. Thanks for taking, and sharing, such lovely photos! Oh, and if you happen to be the sort of photographer who’s drawn to farmers’ markets, check out the flickr pool I created for photos taken at the Peoria RiverFront Market. The Market starts up again the first Saturday in June. Bring your camera. This Saturday I spent the day at the Fancy Schmancy Market. 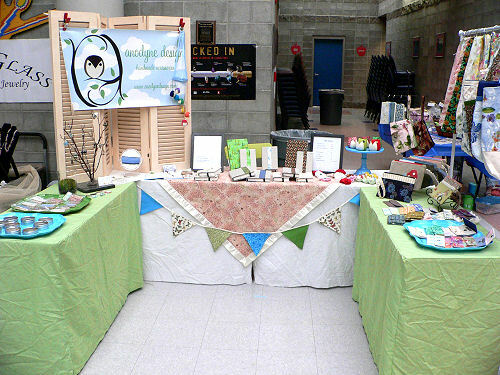 The market was held indoors, which was a nice change from last weekend’s cold outdoors event. Especially since it ended up raining this weekend! The market went well, although it was not as highly attended as anyone had hoped. Those who did come by were a pleasure to see, and as usual, I enjoyed talking with everyone who stopped for a moment in my little booth. When there was a lull in shoppers, I used the time to get to know some of the other vendors there. There were a lot of great people and things at the market: Sea of Glass Designs was there with some really lovely jewelry, Carrie’s Crafty Cottage was there with the cutest hand-knit cupcakes, and Razorberries was there (and I finally got some fabulous notecards). There were also some new Big Hoots in my booth this weekend. 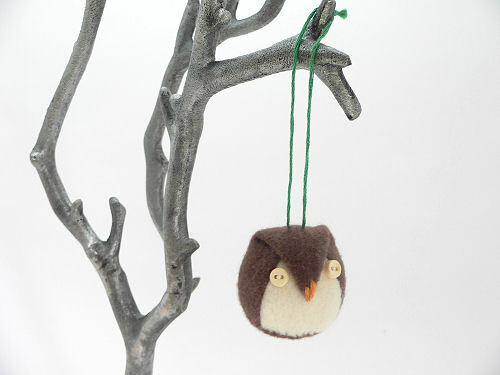 They are twice the size of the Little Hootie Owls, and perfect for watching over the little ones. Most of them were gone before noon, so I think I’m on to something here. I’ll definitely be making more. And thanks to a special request, I’ve started branching out into owls made with cotton prints, in addition to the felt ones. One of my favorite things about selling online is when my customers tell me what they plan to do with what they’ve bought. Better yet, some of them even send me a photo of their Anodyne Design item in action. I love these photos. They’re so gratifying. Thank you, awesome customers, for sending a little love back to me. On top of the warm fuzzies I get from seeing an action shot, it has recently occurred to me that some of these shots might be useful to other potential buyers, too. 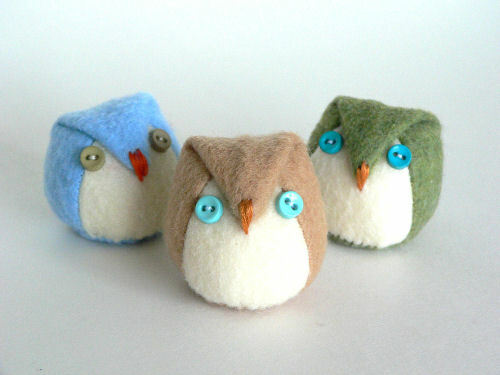 For example, I have a friend who thinks the Little Hootie Owls are cute, but can’t seem to imagine what they are for. So it would probably be extra-helpful for people like her to see some of the owls being used by actual people. 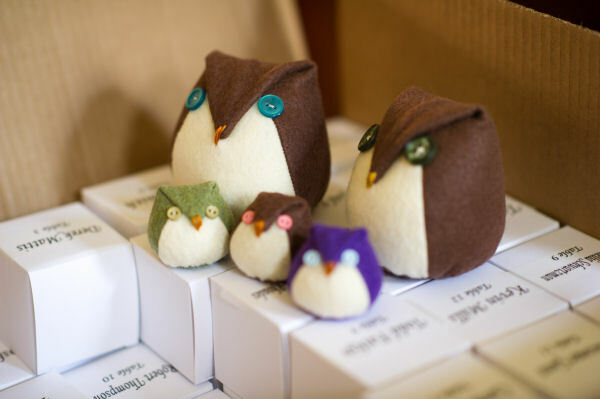 Another local friend recently told me that the owls are much cuter in person, and that they are smaller than she realized based on my product photos. Again, action shots could help a lot in this sort of situation. I keep an album on Anodyne Design’s facebook page just for action shots. 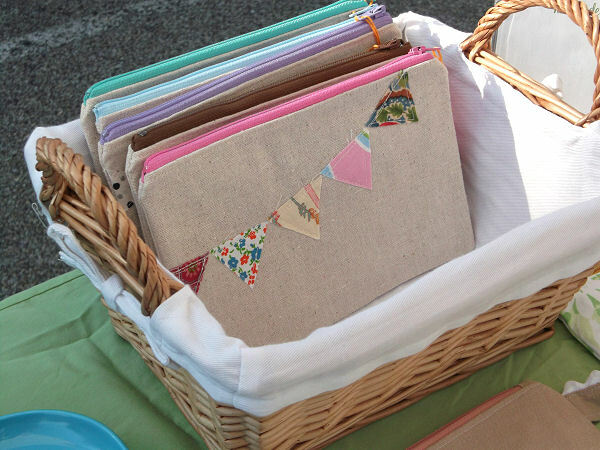 If you have something from Anodyne Design, I’d love it if you would share a picture! 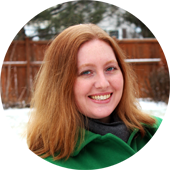 In fact, I love action shots so much, I think I may be announcing an Anodyne Design Action Shot contest soon. Stay tuned for that. Until then, I would love to hear your thoughts on action shots. Do you love them and save them like I do? Never thought of them? Have a better use for them that just keeping them for warm fuzzy feelings? Let me know! 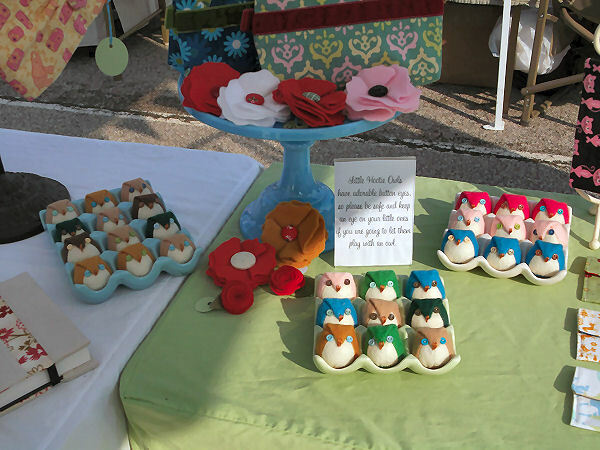 Here’s a little peek at the Tiny Toadstools and Snowy Little Hootie Owls that debuted at the Peoria Academy Holiday Fair this weekend. I absolutely love how the snowy owls turned out. Because they are all white, I added cream or grey appliqued faces to help their eyes stand out, and I think they look darling. And perfect for the chilly winter ahead! 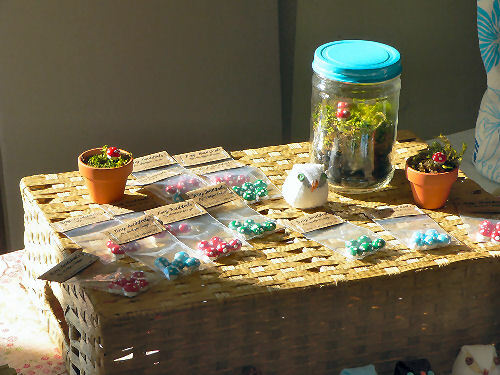 I also added Tiny Toadstools, sets of five little hand-painted button mushrooms in red, green, and turquoise. I think they look great nestled in among the moss in my handmade terrarium (which requires no water, because it’s decorative craft store moss. My kind of plant!) 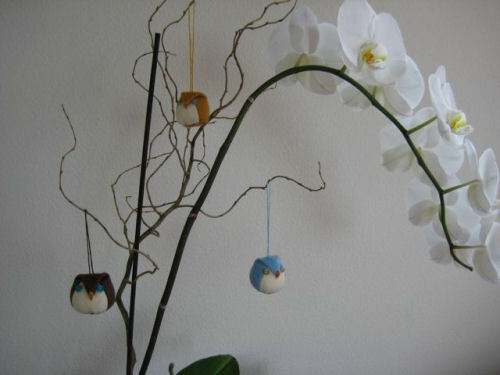 The tiny toadstools and snowy owls (along with little Hootie owls in goldenrod, plum, and blueberry) will be appearing in the shop either Sunday or Monday, so be sure to check in! 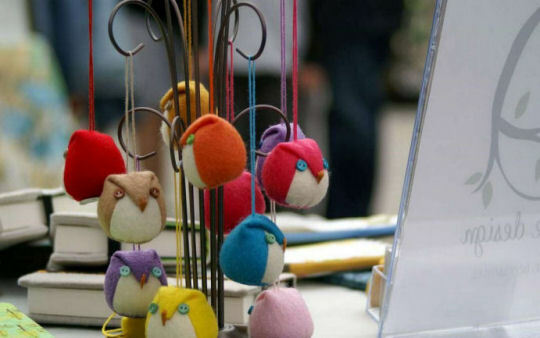 As for the craft fair, it was a nice day, if a bit slow. I had an opportunity to visit the other vendors, buy myself a pretty hematite bracelet, and talk with the shoppers, which is always one of my favorite parts. This fair got me all excited about the Fancy Schmancy Holiday Shoppe next weekend. It’s going to be fun! 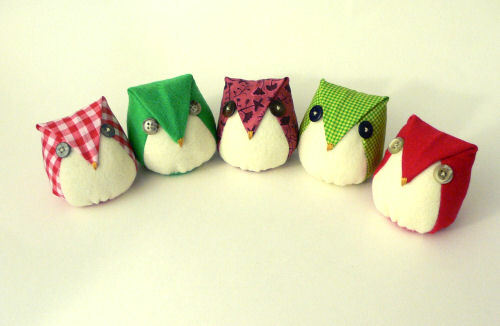 The slowness also gave me time to make a bunch of new owls, and I can’t wait to share them with you! When does a parliament become an army? 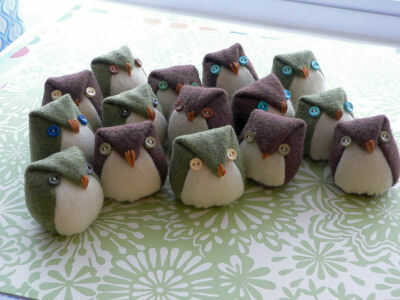 My parliament of tiny owls continues to grow! I love these little guys, and making them has almost become addictive. I’ll be listing them on Etsy once I get some decent sun to photograph them in. Until then, you can expected to see them at the Fancy Schmancy Fall Festival down on the Peoria Riverfront this Saturday morning. And if you aren’t in the area (or even if you are! ), you can enter to win one on my Facebook fan page. All you need to do is 1) be a fan and 2) write me a little haiku about anything you like. On Saturday, October 17th, I’ll choose two winners, one random and one who writes my favorite haiku, and each one will receive a tiny owl! I hope you’ll play along. Haikus are so easy and fun. (If you aren’t familiar with haikus, they are short, 3 line poems. They don’t need to rhyme. All they need to do is be structured so that the first and last lines each have 5 syllables and the second line has 7.) Good luck!